The Irish Tourism industry needs to work towards changing the perception amongst overseas visitors to reposition Irish Food and Drink from being a pleasant surprise to becoming one of the compelling reasons to visit Ireland. Those were the remarks from Paul Keeley, Director of Commercial Development at Fáilte Ireland, at a briefing to tourism and food and drink industry representatives on the publication of the tourism body’s new Food and Drink Development Strategy 2018 – 2023. Mr Keeley said that the vast majority of overseas visitors are positively surprised and satisfied by the overall quality of Ireland’s food and drink offering and return home having had a memorable experience during their visit but, prior to coming, their expectations of Irish food and drink are lower. In 2017, revenue from overseas visitors totalled €6.5bn with approximately a third – about €2 billion – spent on food and drink. 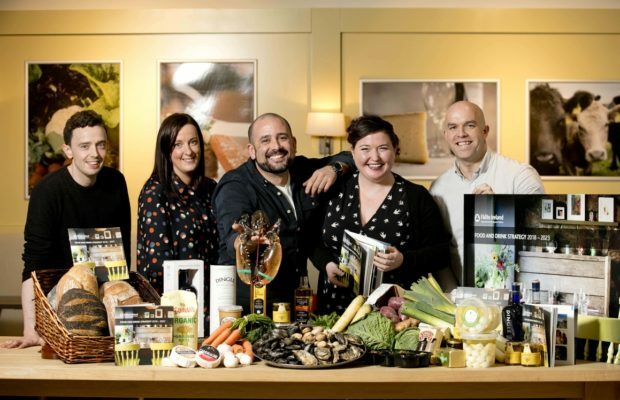 By targeted investment and effective promotion of the quality food and drink experiences available, the report claims that food could help grow tourism revenue by as much as €400 million over the next 5 years. Failte Ireland Food Tourism Officer Sinead Hennessy and Failte Ireland Food Ambassadors at the launch of the new strategy in Dublin.